As a general rule of thumb, we Asians don't normally get in contact with cheese. It is not something that's included in the diet we grew up with (unless you count paneer, or cottage cheese, in Indian cuisine) and for lactose intolerant people, well that's even more out of the question. However, I discovered the wonderful world of European cheese, like most Singaporeans, when I opened up my taste to love European cuisine and wine, and when I travelled to France, Switzerland, and more recently, Spain, Italy and Portugal. It has gotten to the point where I don't find it weird to have cheese after a meal, and often have a few chunks of them in my fridge at home for snacking! 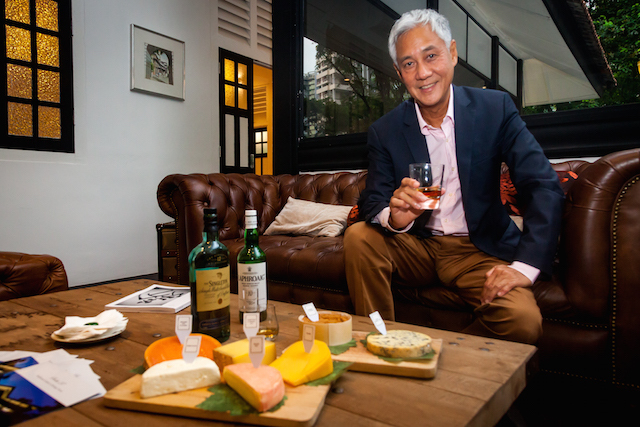 Thanks to the EU and CNIEL (French Dairy Interbranch Organization) I had the chance to attend a European cheese appreciation masterclass with food and wine expert Mr. Edwin Soon at Scotts 27 to really learn about what I am eating blindly in the past. I've learnt quite a few things, which I will share in an anecdotal fashion below (they are fact-checked with online research). There's also a $50 European cheese hamper to be won so read till the end! 1. Cheese is very old. It's known that cheese has been in existence more than 5,000 years ago! How it came about was when riders put cow's milk and water in a goat's stomach as a pouch and rode on horses with them, hence churning the milk with a component in the goat's stomach that fermented the milk. I really applaud the guy who first discovered that thick curd and decided maybe just taste it and see how it is like. 2. There are over 1,200 varieties of cheese alone in France. Not counting other countries. What I like is that the EU has very stringent checks when it comes to cheese production (apparently where it is aged is very important) so the highest quality and safety is assured. Very much like wine. 3. Cheese that's pasteurized lose half the intensity of taste, so most of the sophisticated cheeses out there are aged raw cheese. 4. 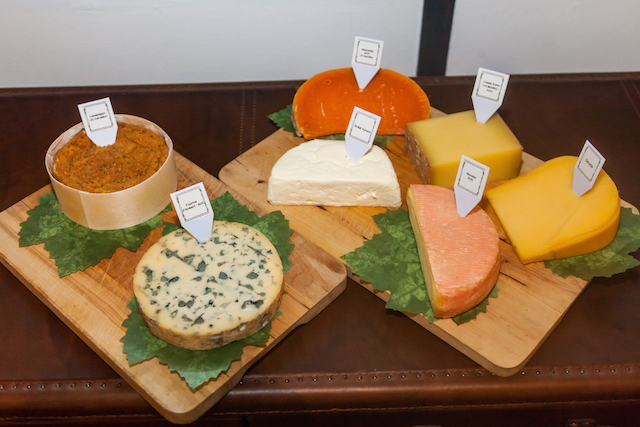 Cheese can be categorized into 4 types according to moisture levels - soft, semi-soft, medium hard and semi-hard or hard. Then there's also the mold, such as soft ripened like the white mold on brie, washed rind, smear rind and blue (by injecting the cheese with particular types of fungus). It felt like I was back in school. The school of cheese. We were taught for example that wine is usually matched with the intensity of the cheese, which I guess is what we'll instinctively know, such as white wine for light cheeses, and fortified wines like port to go with heavy or hard cheeses. This was the 7 cheeses we tried during the session. Notice two little cups -- they are in fact, jasmine and earl grey tea, which will be paired with cheese. Now that is a new revelation for me. 3) Brillat Savarin paired with Cote du Rhone, E.Guigal Blanc - White Wine: Rather typical, though the soft cheese was delicious. 4) Munster paired with Bourgogne VV, Henri Perrot Minot - Red Wine: The munster was quite strong tasting, but counteracted with the red to become more 'rounded' if there's that word? 5) Fourme d’Ambert (blue cheese) paired with Quinta do Silval 1997 - Port. Having just tasted really good port in Porto, I was quite excited about this pairing, but I found the blue cheese to be too salty and hence a little distracting. Still the honey sweetness of the port I would imagine will go well with a good blue. 6) Aged Mimolette paired with Laphroaig 10 - Whiskey. Another surprising pairing, with whiskey! The Laphroaig is very peaty aka smokey, and counters the strong hard mimolette well. This dark orange coloured hard cheese by the way was the favorite among quite a few of us! 7) Calvados Camembert paired with Singleton - Whiskey. The camembert was quite 'smelly' but delicious with the whiskey, once again. The most surprising revelation we had was the tea pairing, but I really enjoyed experiencing all the different flavours that came out from the 7 European cheeses, using the 5 different beverages. Thanks to Mr. Edwin Soon and Scotts 27 for hosting and introducing me to all of them! Open your taste, enjoy European cheese, indeed. If you like to find out more, do join this Facebook Page. And now, like all good classes, there's going to be a pop quiz in which one lucky commentator with the right answer will win a $50 European Cheese hamper with 5 kinds of cheeses (Comte, Munster, Fourme d’Ambert, Mimolette and Calvados Camembert) to be collected in person. Name 3 types of hard cheeses, and tell us what drink you'll pair one of them with. One lucky commentator will be notified by email on how to collect your hamper by 30th Nov.
What are you waiting for? Comment now!